The Sixth Karmapa was born in Ngomtö Shakyam, near Karma Gön in eastern Tibet, to a family of tantric practitioners. One day, when he was only a month old, he was being held by his mother when they met Ngompa Chadral, a disciple of the previous Karmapa. The infant Karmapa became very excited, and when Ngompa Chadral asked for his name, Thongwa Dönden smiled and replied, “I’m the Karmapa!” Ngompa Chadral took the child Karmapa into his care for seven months and then took him to Karma Gön Monastery. When he was three years old, the entire Kagyu lineage transmission was bestowed upon him by Ratnabhadra, his spiritual heir during his former life. He received ordination from Khenchen Sönam Zangpo, and was then presented with the Black Vajra Crown and enthroned as the Sixth Karmapa by Shamar Chöpal Yeshe at Karma Gön. Thongwa Dönden began to teach while still relatively young. He started composing many tantric rituals that, in time, became established as a body of liturgies for the Kamtsang Kagyu lineage. He also introduced the lineages of the Shangpa Kagyu and the Shijay into the main Kagyu transmissions. His activity was tireless, and he dedicated his life to teaching, composition, founding and restoring of monasteries, printing sacred books andstrengthening the sangha. He also began to develop the Karma Kagyu shedra (monastic university) system. He had many students, though Tashi Namgyal, Goshir Paljor Döndrub, and Bengar Jampal Zangpo were his main disciples. The Sixth Karmapa recognised Tashi Namgyal as the reincarnation of the First Tai Situ Rinpoche, Chökyi Gyaltsen, and enthroned him as the Second Tai Situ Rinpoche, investing in him the responsibility of Karma Gön Monastery. Foreseeing that his life would be short, the Sixth Karmapa designated a regent, the First Gyaltsap Rinpoche, Goshir Paljor Döndrub, indicating to him the time and circumstances of his next rebirth. He then entered retreat. He passed into Parinirvana at the young age of thirty-six or thirty-seven. 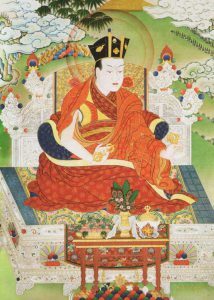 His main spiritual heir was Bengar Jampal Zangpo, composer of the famous Mahamudra lineage supplication, the Short Prayer to Vajradhara (Dorje Chang Thungma).